Is this the biggest hopeful news event of the week? "Travel Ban Stayed by Court." Story #1: My mother, in the 1960/s, resented dual signs in English and Spanish. "We had to learn English. So should they!" She referred to the ban on German language during World War I in many states. Since the U.S. made that anti-German language mistake forty years earlier, we should make it now? Again? Mom had a memory of this: neighbors throwing rocks and potatoes at my dad's childhood home near Spokane, WA, to strike out against his family's use of German. I read it differently than my mom. Because my family suffered abuse, I prefer to welcome immigrants and refugees with all of their baggage including language and culture. Then there's the religious wisdom counseling that we welcome the foreigner, too. The Jewish and Christian scriptures teach: "God executes justice and loves the sojourners. Love the sojourner therefore." (Deut. 10:18-19. My summary. Story #2: Today I walked in my neighborhood. I live in Washington County, Oregon, in the Portland metropolitan area. I passed the closest Mandarin school, just a block from my home. 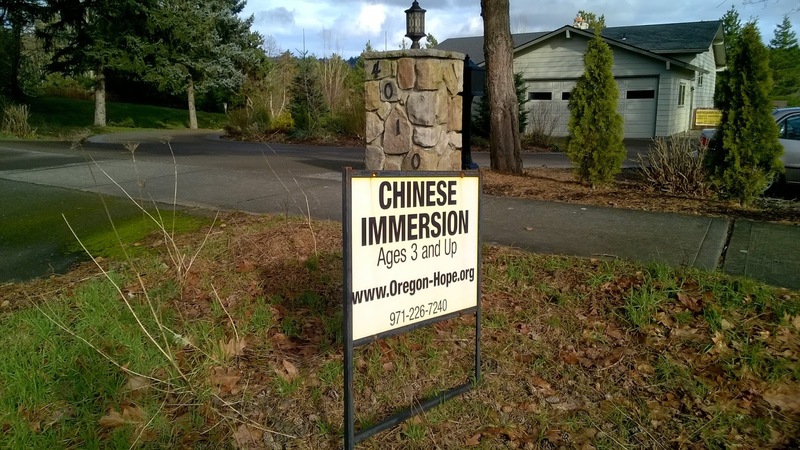 It's run by a Chinese couple for young kids. This is one of several such schools within a few-mile radius. "Learn thy parents' language" is the command. One day last spring when I walked by this same school a teacher was leading a class of ten or so young kids to a playground across the street. So I asked the teacher, "Are you speaking to the kids in Mandarin or English?" "We are speaking Mandarin," she replied (in English). 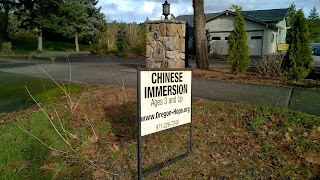 Thankfully, no one throws rocks at the Chinese Immersion school for teaching Chinese. The kids are learning Mandarin, which will be a useful skill when they're working after graduation. China is a big market for goods made by businesses no more than a few miles away from my home. I meet people of many races on my walks, in the grocery stores, at restaurants, on public transportation, at my grandchildren's school band concerts and track meets. Now, how does the U.S. fit into global demographics? Look at the U.S. population pyramid. What do you see? I see that the base is narrower than the middle. This visual shows that our birth rate is below replacement level. In other words, if it weren't for immigration our population would shrink. 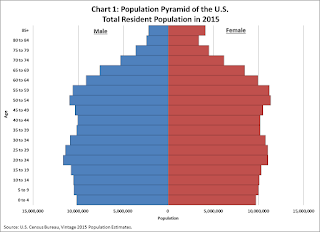 Now look at the world population pyramid. Photo in the public domain. Source: C.I.A. You see here that the world is a reservoir of younger people eager for a chance to fill gaps in the U.S.A.: Gaps in university student bodies. Gaps in businesses.Gaps. The U.S.A. needs their skills, their energy and their contacts back home. Chancellor Merkel recently reminded Germans that immigrants will acculturate and help to boost the German economy. The same holds true in the U.S. for similar reasons: neither Europeans nor Americans are having children at a sufficient rate to reproduce the population. Why doesn't our national leadership make the same point as Chancellor Merkel? 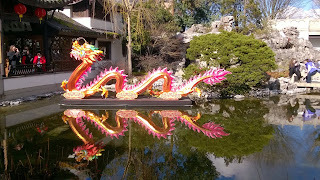 Tomorrow my family is going to the Chinese district in Portland to join their community in celebrating the Chinese New Year. It'll be fun, and I'm glad they're here. 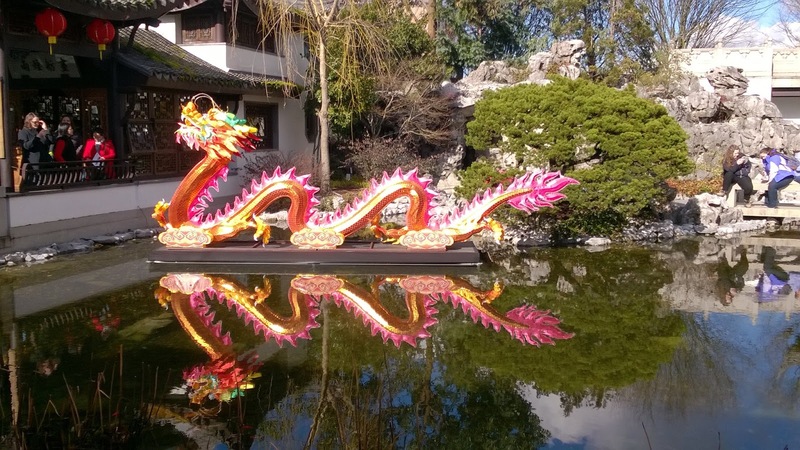 Paper dragons and all. This is America, I'll bet that my community is a lot like yours. So why aren't congressional Republicans celebrating the stay of the ban? The ban put America at far greater risk than does the welcome mat, both short term and long term..